Angels and Immortals were not the only superhumans that had succeeded in separating themselves out during the tiume of chaos and new genesis A third species had realized a monstrous and magnificent dream of power. These were often designated by the name of Superelephants. They preferred to call themselves Dominators, Masters -- or Gods. Han Ryner (1861-1938) was a French anarchist, a philosopher and a startlingly original science fiction writer in pre-Wellsian, French scientific romance; he was once voted the Prince of Storytellers by a popular magazine. 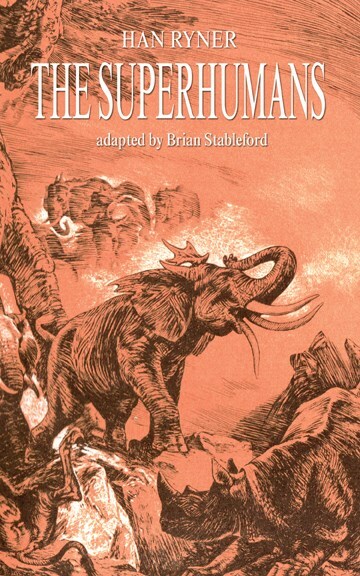 In The Superhumans (1929), Ryner tells stories of the Time of the Mad Sun, a second sun which lights the Earth in the far future, when a race of giant and super-intelligent Mastodons has arisen to rule the Earth and enslave Mankind… He entertains us with the Travels of Psychodorus, the Cynic Philosopher (1903), who, like Gulliver, encounters Eyeless Men, Retrograde People and many others strange subcultures… In 1896, he foresaw the revolt of sentient machines (1896), imagined the crimes of a solitary sociopath in the enlightened year 2347 and the creation of hybrid man-apes.